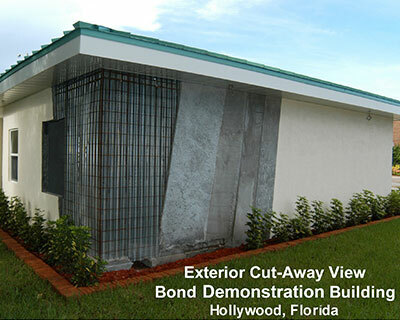 Bond Building Systems, Inc. has developed, patented and owns all rights to intellectual property involving the design, erection, and construction of walls and buildings using an expanded metal core material to which concrete is applied to form the walls for buildings to which a variety of roof systems can be attached. The Bond Building System forms a structure that is extremely durable and hurricane, earthquake, termite, fire, and mold resistant. The Bond Wall components can be compactly packaged for convenient shipping to all parts of the world and can be cost effectively erected on site in very short periods of time with relatively unskilled labor. The Bond Building System can be effectively used for many kinds of structures such as privacy and security walls, affordable housing in the U.S. and for Developing Nations, world class upscale housing, military housing and facilities, educational and institutional facilities, jails and prisons and commercial and industrial buildings. It is most cost-effective, however, when used for single story floor plans using repetitive structural designs. 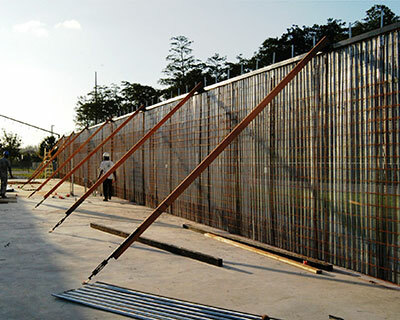 The Bond Building System includes a reusable steel beam system which temporarily supports a steel curtain and reinforcing rebar forming the exterior walls of the building. The steel curtain is then sprayed with concrete from both the inside and outside of the building forming a solid steel reinforced concrete structure in which the walls, floor slab, and footers are all unified. The reusable steel beam system is then moved to the next structure in the series. Another unique characteristic of the System is that all of the hurricane straps which are tied into the steel curtain and rebar inside the concrete walls are in the perfect location to accommodate the truss layout for the roof system. A variety of roof systems can be used with the Bond Walls and, if properly engineered, can be secured to the walls so as to be substantially hurricane resistant. The Bond Building System produces a stronger more durable structure faster and less expensively than other building methods. Because of all of the foregoing, we are not in the business of building one-of-a-kind houses or extremely small housing projects. Bond is in the business of licensing its proprietary technology and intellectual property by, selling, and distributing its services and proprietary components and related building products and materials throughout the world. For projects involving larger numbers of repetitive structures, however, we can approach the project as the builder if requested or provide the training and proprietary components to a builder and license him to use the Bond technology. We welcome you to visit our facility in Ft Lauderdale, Florida to get acquainted and learn more. Thank you for your interest in Bond Building Systems. Fire, Termite & Insect Resistant. Steel Reinforced Shotcrete Structure in which the Floors, Footers, & Bond Walls are Unified. We use 3,000 PSI concrete mix and apply it to the walls using a shotcrete machine, hence creating 6000-6500 PSI shotcrete walls that are impervious to impact and impenetrable by moisture. Compact for Economical Shipping to All Parts of the World. The Bond Components for sixty-four 600 sq. ft. homes can be shipped in a single 20 ft. container. Rapid Construction on Site with Minimal Skill Level. Three to four workers, only one of which must have minimal construction experience, can complete the shell of a 600 sq. ft. house in just five days with minimal tools. Cost Effective. The shell of a Bond Structure will generally cost you a little less to erect than to do so with concrete blocks, but the Bond structure will be much stronger and can be completed much faster; and, “time is money”! Force Protection” for Government & Military Projects.